Slip-and-fall accidents can result in painful injuries, requiring missed time from work and preventing the injured from performing everyday tasks. The vast majority of slip-and-fall injuries can be prevented by property owners taking steps to provide safe conditions for visitors and occupants. The Orlow Firm represents people who have been injured by the negligence of property owners in Bronx slip-and-fall accidents. At our law firm, you will always work with a partner. We believe you should expect that from any personal injury law firm you hire. Call (646) 647-3398 to schedule your free consultation. You can also submit a contact form and we will be in touch with you promptly. In one of our successful cases, we represented a woman who suffered reflex sympathetic dystrophy after a slip-and-fall accident during a construction project at her housing unit. Her slip-and-fall settlement totaled $715,000. The woman’s case is just one of our many success stories. How Do Bronx Slip-and-Fall Accidents Happen? These accidents can happen at work, in stores, at other people’s homes and many other places. Those who are responsible for your injury should be held accountable. 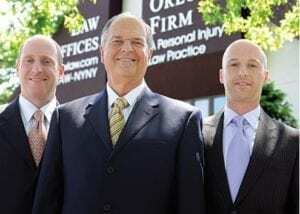 At The Orlow Firm, our Bronx attorneys are ready to assist you with your injury claim today. In The Bronx, property owners, grocery store owners, retail store owners and even large corporations can be held liable for your injuries if negligence was the main cause of your slip-and-fall accident. It is just as unacceptable for a property owner to neglect the repair of cracked walkways and faulty railings on staircases as it is for a store owner to ignore standardized safety procedures by neglecting to place warning signs when the floor is wet or an item recently spilled on the floor. Slip-and-Fall Injuries: Where Do They Most Commonly Occur? If you or a loved one suffered an injury due to a slip-and-fall accident in The Bronx, our qualified and experienced lawyers will offer a confidential and honest assessment of your case. Our cases are handled on a contingent basis, which means that we are paid only when we recover money damages. We will come to you if you cannot come to us. We will come to you if you cannot come to us. Se habla español. Contact us online or call (646) 647-3398.